Each year in America, unintentional carbon monoxide poisoning claims more than 400 lives and sends another 20,000 people to hospital emergency rooms for treatment. There are simple steps you can take to protect yourself from deadly carbon monoxide fumes. 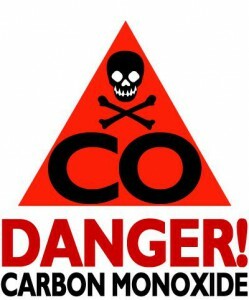 PROTECT YOURSELF AND YOUR FAMILTY FROM CO POISONING? 1. Install at least one carbon monoxide alarm with an audible warning signal near the sleeping areas and outside individual bedrooms. Make sure the alarm has been evaluated by a nationally recognized laboratory, such as Underwriters Laboratories (UL). Carbon monoxide alarms measure levels of CO over time and are designed to sound an alarm before an average, healthy adult would experience symptoms. It is very possible that you may not be experiencing symptoms when you hear the alarm. This does not mean that CO is not present. 2. Have a qualified professional check all fuel burning appliances, furnaces, venting and chimney systems at least once a year. 3. Never use your range or oven to help heat your home and never use a charcoal grill or hibachi in your home or garage. 4. Never keep a car running in a garage. Even if the garage doors are open, normal circulation will not provide enough fresh air to reliably prevent a dangerous buildup of CO.
5. When purchasing an existing home, have a qualified technician evaluate the integrity of the heating and cooking systems, as well as the sealed spaces between the garage and house. 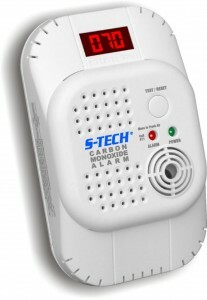 The presence of a carbon monoxide alarm in your home can save your life in the event of CO buildup. 2. Turn off all appliances and sources of combustion (i.e. furnace and fireplace). 3. Ventilate the house with fresh air by opening doors and windows. 4. Call a qualified professional to investigate the source of the possible CO buildup. 1. Evacuate all occupants immediately. 2. Determine how many occupants are ill and determine their symptoms. 3. Call your local emergency number and when relaying information to the dispatcher, include the number of people feeling ill.
4. Do not re-enter the home without the approval of a fire department representative.